When we first wrote about Genwi a year ago, it was a social feed reader with content feeds that could be organized by different categories (blogs, news, videos, music, podcasts) and shared with your friends. Today, it is relaunching with a completely new design that takes into account what your friends are doing across the Web as well. You can think of Genwi as a combination of Google Reader and FriendFeed with sophisticated search, auto-categorization, and filtering features. As before, Genwi is a super RSS feed reader. It suggests feeds by category, or you can add your own (via search or by importing an OPML file from another reader). 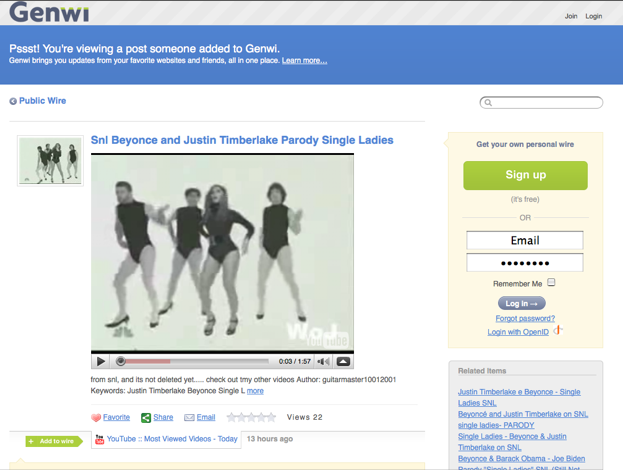 You can also invite your friends by giving Genwi permission to match its members to your contacts in Gmail, Yahoo Mail, LinkedIn, AOL, Outlook and elsewhere (although it does not have Facebook integration yet). Once you do that, you can track your the social activity of your friends across the Web, just like on FriendFeed. 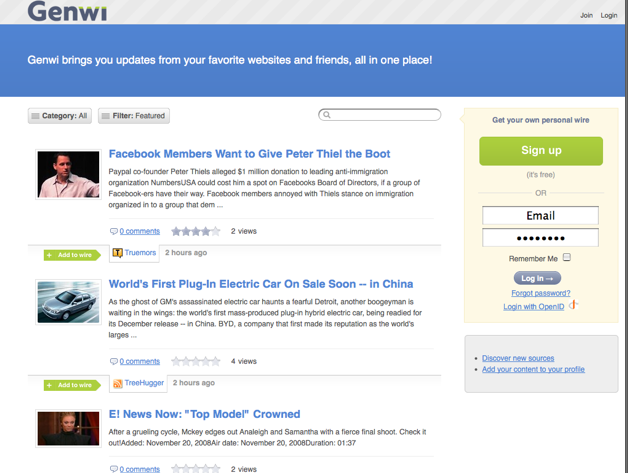 Anytime a contact does something on Twitter, Digg, Flickr, YouTube, or other social media sites, it appears on Genwi. (The other supported services are Vimeo, Blogger, WordPress, Tumblr, Pownce, Yelp, Upcoming, Last.fm, iLike, del.icio.us, ma.gnolia, Jaiku,Webshots, Picasa, Smugmug, Zoomr, Furl, Reddit, Mixx, and Diigo). At first a web page was a published document. It has evolved to a collection of objects—wading through all of these objects by searching and loading pages may not be the most efficient way to consume them. It might be better to bring in all the objects that matter to you and create a context enabling you to filter and directly consume what is most interesting. Once all the objects are ingested into Genwi, it starts to do some interesting things with them. Each post/video/song/object can be filtered by type and category, as well as by most popular, highest rated, and most recent. They can be rated, shared, or added as a favorite. All of your friends favorites show up in your wire (which is what Genwi calls your personal super feed). The most popular items are available in a public wire, which can also be sorted in various ways. When you search for things, favorite items across the network come up top, adding an element of social rank to the searches. There are other features that noteworthy as well. You can follow other people’s wires without having to “friend” them. If you wan to send a “quick post” to all your friends, it will appear Twitter-like in all of their feeds (FriendFeed has something similar called “messages”). It handles all sorts of media quite adeptly. And it does a better job of showing what’s popular on the service in a very granular fashion. On the downside, the site takes longer to load than FriendFeed and is not quite as responsive. But it has a few tricks worth checking out.